Hi everyone, Deanna here with another project for Dies R Us. I don't know about you but I have been getting emails about Christmas in July specials the minuet it hit July 1st. So, I thought I would do a Christmas in July project. Here is what I have for you today. I started with a light grey colored card stock cut and folded to make a 4 1/4" X 5 1/2" card base. I then cut a mat out of some glittered card stock from my stash. The mat was cut at 4" X 5 1/4". Next I cut the patterned glitter card stock at 3 3/4" X 5". For my ornament I used the Stitched Graham Die for the top layer and the Drop Ornaments Layers for the back layer of the ornament. For the diamond shape mat that my ornament is on I used the Memory Box Open Studio Stitched Squares dies. To make the ornaments, I die cut the images out of some toner paper that came with my Minc. For the back layer I applied some green foil and ran the image through my Minc to set the foil. For the top layer, I applied some gold foil and ran that through my Minc to adhere my foil. I just love the shine the foil adds to the images. My sentiment is stamped with some Memento Cottage Ivy ink on some Vellum. I let the ink dry for a short while then adhered the Vellum to my card by placing small dots of adhesive behind the letters in my sentiment. There you have it. My completed card. Just in case you didn't know, or haven't subscribed to the newsletter yet (which you really should do) Dies R Us is having a Pre-Order for the new Holiday release of the Memory Box and Poppystamp Dies. Dies are expected to arrive July 7th so hurry over and get your order in so you can be one of the first ones to get these new awesome dies. I hope you will join in on the fun over at the Dies R Us Challenge blog. Be sure to pop over to the Dies R Us store to do some shopping while you are here. And don't forget to like us on our Facebook page. You don't want to miss out on anything that is happening at Dies R Us. Fabulous Christmas card, very elegant. I love the glittered card stock you have used, and the bauble die is gorgeous, particularly the way you have foiled it. Just beautiful Deanna! And, that little pop of color is perfect! Great job! 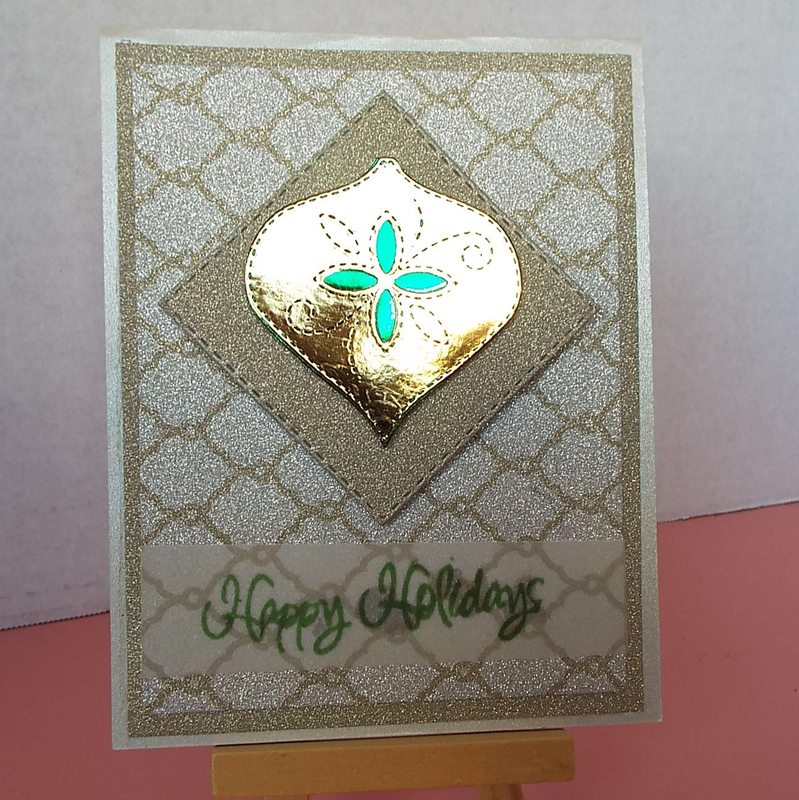 Beautiful, that foiling with the die is such a festive and lovely touch! Beautiful colors. Love the golds with the green. Gorgeous Deanna! I love all the glitz and glam you used. That ornament really pops of your lovely layered background. Beautiful!! Beautifully done!!! love the color combination!